Be the first to share your favorite memory, photo or story of Irena. This memorial page is dedicated for family, friends and future generations to celebrate the life of their loved one. 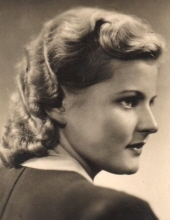 Irena M. Galinis, a woman of exceptional beauty and grace, passed away peacefully after a full life of 95 years at her home in Lemont, Illinois, on March 21, 2019, with her two daughters by her side. Born on December 19,1923, to veterinarian doctor Kazimieras and Helena Trumpis, she grew up in Europe in independent Lithuania. Irena had a lovely voice and enjoyed singing; she also spoke a number of languages fluently including Lithuanian, German and English. In her youth Irena excelled in ice skating. She met and married Bronius Galinis, a civil and structural engineer, and they shared 47 years until his passing in 1990. The chaos and destruction of World War II had forced them to flee for their safety to Western Europe. Their family, by then including two little daughters, emigrated to the United States entering Ellis Island in 1949, and some years later all gratefully became United States citizens. They settled in Massachusetts, at first in Cambridge, then Dorchester and finally to a home in the beautiful woods of Norwell near Cape Cod which they enjoyed very much. Irena was a charming and gracious hostess to their many friends and was known for baking delicious cakes and pastries. Irena was employed for 27 years at Jordan Marsh Company and she was also very active in the Lithuanian community in the Boston area. In 1995 she moved to Lemont, Illinois, to be closer to her family. She is survived by her daughters Jura Galinis-Kredys and Giedre Pencyla; her grandsons Andrius Mikonis (Carole) and Nemura Pencyla (Michelle and their children, Lauren and Nicholas); her sister Maryte Cernius; nephew Dr. Edmund Fiksinski (Dr. Magda and their daughter, Julia); and cousins in the United States and Lithuania. Irena loved and very much enjoyed the company of her great grandchildren. Her family shall remember her sparkling blue eyes, beautiful smile and generous and loving spirit. She will be greatly missed. On Saturday, April 6,Visitation will start at 9 am followed by a Funeral Mass at 10 am at St Isaac Jogues Catholic Church, 306 W. 4th Street, Hinsdale, IL. Inurnment at Bronswood Cemetery, 3805 Madison Street, Oak Brook, IL. In lieu of flowers, memorials to the Juvenile Diabetes Research Foundation at www.jdrf.org appreciated. To send flowers or a remembrance gift to the family of Irena M. Galinis, please visit our Tribute Store. "Email Address" would like to share the life celebration of Irena M. Galinis. Click on the "link" to go to share a favorite memory or leave a condolence message for the family.